Capt. 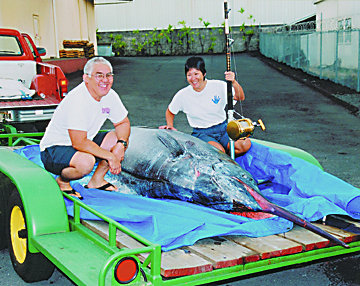 Nash Kobayashi was baiting at 6-mile buoy outside of Hilo on the 20-foot OCEAN WARRIOR when he hooked their jumbo-sized Pacific blue marlin. Michelle fought the fish using a 130ST Penn International reel and Maxima 130-lb test Ultra Green line. It was Hawaii's third grander of 2001.